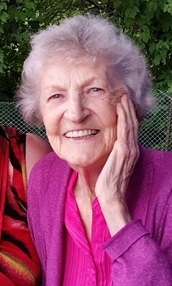 Obituary for Bessie Frances (Reid) Dares | MacIntyre Family Funeral Home Ltd.
Peacefully on December 1, 2018 at Hospice Wellington, Guelph. Bessie Dares, in her 92nd year was the beloved wife of the late Clyde Dares (2007) and loving mother of Martha Dares, Weldon Dares, Dana (Wendy) Dares, Stephen (Fernanda) Dares, Kathleen (Gordon) Grey and the late Alan (Karen) Dares. Bessie will be forever remembered by her many grandchildren and great-grandchildren.